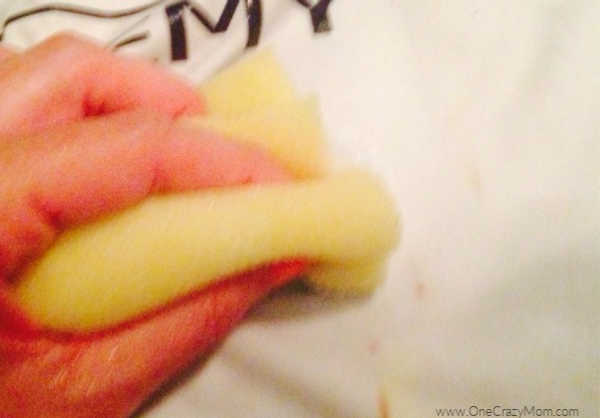 Learn how to remove blood stains quickly and easily with only 2 ingredients. 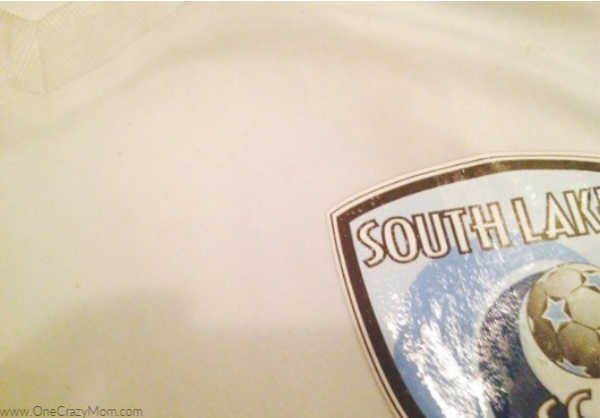 Save your kids clothes by using these tips to remove blood stains. How do you remove set in blood stains? 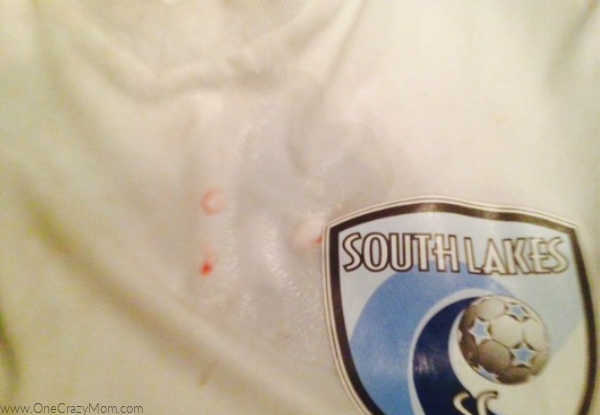 The worst is when your child gets a bloody nose and he happens to be wearing his white (over priced) soccer jersey and has set the stain. 😉 However, blood is really easy to get out and you probably have one, if not two, of these things at home. Choose a removal method and remove a blood stain quickly and easily. Treat the stain and be amazed as the blood stains from clothing that are removed. This is real life and well stains happen. Especially if you have kids. Get started with these easy and inexpensive tips to have your clothes looking brand new again. I promise it is really easy! Let’s get started learning how to remove blood! These tips are easy and frugal. You can do this quickly and easily at home. The cost is so minimum that you will be pleasantly surprised how little you have to spend to have such a great impact. I love a good deal and I’m sure you do too! 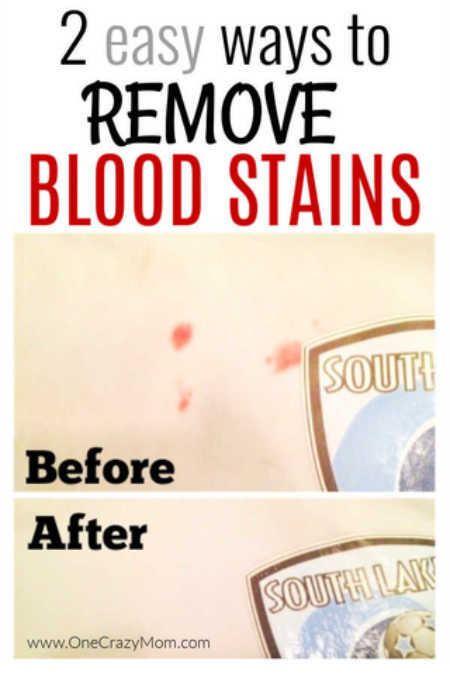 Find out the best way to remove blood stains! Don’t toss those stained clothes. You can get the blood out easily and make your clothes good as new. 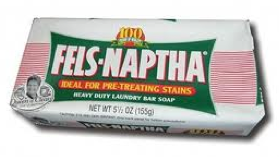 Use the Fels-naptha bar. I talked about how this simple bar is by far the best stain remover, and blood stains are no problem for it too. Fels-Naptha bar is found in almost any store and even on Amazon. I have bought it at Crest (locally) and Walmart. You will find it in the Laundry detergent aisle, so it isn’t hard to find. It is cheap too. The cost is only around $1 – actually we paid $.98. Talk about cheap and a great product. We love products that work so well and for them to cost so little is a big plus in our book. Step 2: Scrub slightly with a sponge and watch the blood disappear. Step 3: Wash like normal and the stain is completely gone. It is really is that easy!! 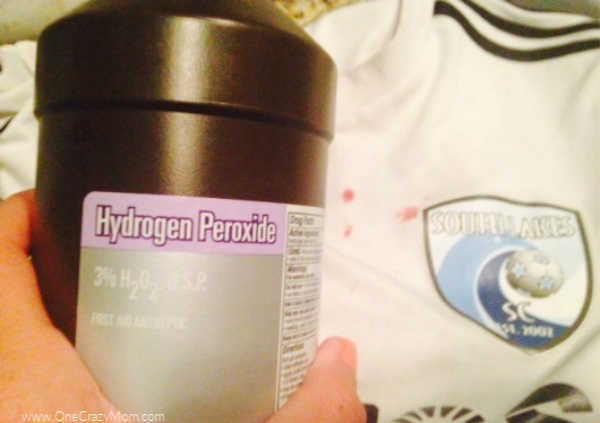 I don’t know if you have ever tried this,but hydrogen peroxide is great to remove blood stains from anything. It won’t hurt the fabric either. You can find Hydrogen peroxide in the first aide aisle of your local grocery store and you can even buy it on Amazon. Step 1 – Pour Hydrogen Peroxide directly on stain. You will be amazed how how the stain just disappears immediately when you start wiping the stains. The kids just thinks it is so cool! Step 3 – Wash like normal in the washing machine with laundry detergent. It is that easy too!! See… you can get really get out blood stains, or any stain really without spending a TON of money or buying some expensive cleaner. It can really get expensive buying fancy cleaners and especially new clothes. Now you can just remove the blood stain with very little time or money spent. It is a win all around. You will love how simple and inexpensive it is. If you have children, this is definitely something you want to save or pin for later. I promise if you don’t need it now you will on day soon! I am always amazed at what a child can do to their clothing. It never ceases to amaze me and it seems to always be on a new outfit. 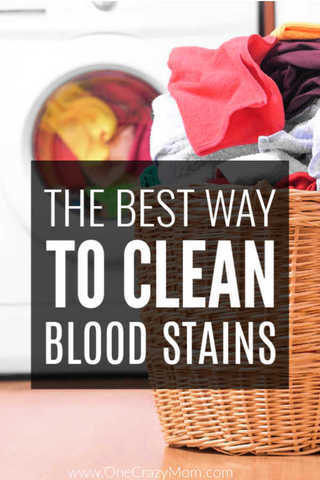 This is the best way to clean blood stains. 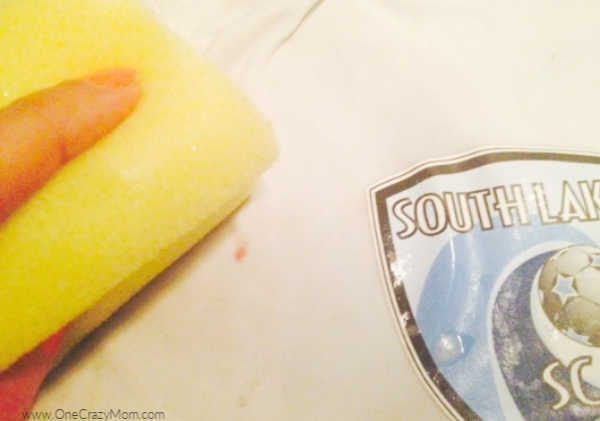 It is so easy and frugal to remove stubborn stains. 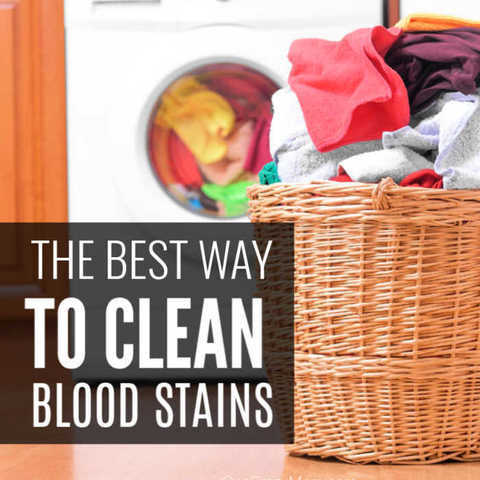 It does not matter if it is a dried blood stain or fresh blood stain, you can get blood out of clothes with these stain removal tips. Make sure to check the care label as to whether or not to wash in hot water or cold water. Colored fabrics can require different wash settings. Can white vinegar remove blood stains? Yes, white vinegar can also remove blood stains by pouring directly on the stain. A baking soda mixture is also helpful. Use water and blot with a clean cloth. Add more water to remove the vinegar. Please share any tips you have. We love to try new frugal ideas. Original blue Windex also does wonders for blood. It also doesn’t matter if it’s fresh or been sitting. 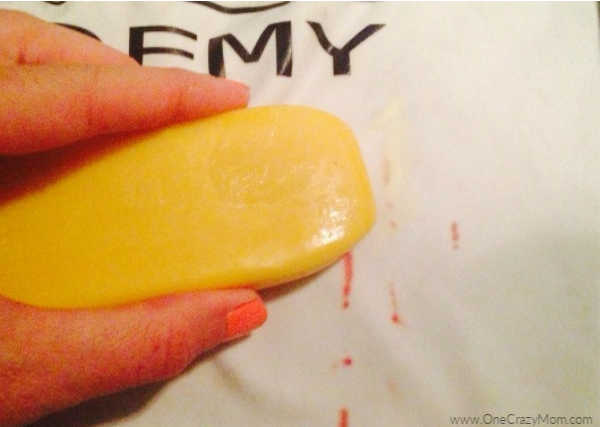 Just spray the spot and wash on warm with your normal soap.